The first Waterman writing instrument that I got my hands on was the beautiful Waterman Perspective Blue Fountain Pen. The pen featured a contemporary design and had a gleaming appearance. However, the pen didn't compromise on quality and was the first writing tool that got me into the world of fountain pens. Since then, Waterman fountain pens have been a prominent choice for me. The latest Waterman Pen that I added into my collection is the new Waterman Hemisphere 16 Luxury Cuivre CT Fountain Pen. Though the series is available in three different models - Bronze, Saphir and Cuivre, it was the Cuivre that won my heart. Frankly Speaking, the pen is a total disguise. The modern technology used to design the pen completely lurks beneath the contemporary appearance of the pen. The mesmerizing appearance of this fine writer was the first factor that allured me towards the pen and compelled me to take this pen along with me. The pen comes in a beautiful box; inside you'll find the pen along with a cleaning cloth and a user manual. At first glance the pen looks perfect, symmetrical slim body, gleaming stainless steel cap etched with "Geographical flow of Art Deco creation" and Waterman Paris engraved trims. The pen looks astonishing and is easy to hold as well. The slim profile of the pen fits snugly between your finger tips and offers a balanced feel. The elegant design of this fine German writer is complemented by a sturdy steel nib. Though made of steel, the nib performs precisely like gold alloy nibs and is built with sturdiness that Waterman is famous for. Overall, the clever construction of the pen is remarkably admirable and strikingly gorgeous. 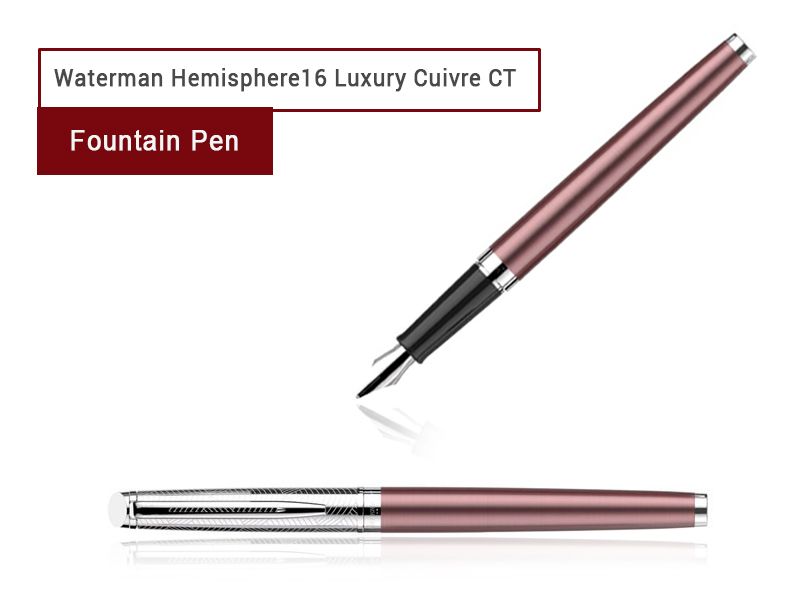 The Waterman Hemisphere 16 Luxury Cuivre is a cartridge/ converter pen, it takes all standard international cartridges but performs best with Waterman Ink Cartridges. If you are not into fountain pens, the series is also available in rollerball and ballpoint versions. Perfectly balanced, elegantly designed, sturdy, the description about Waterman Hemisphere 16 Luxury Cuivre Fountain Pen can go on and on. The timeless elegance and thin price tag makes this writing instrument a premium choice for fountain pen enthusiasts and students alike. Like other pens from Waterman, this unique masterpiece also carries the determination of Lewis Edson Waterman and offers an exquisite writing experience. The premium design of the pen evokes Waterman's traditional approach and is labeled with a thin price tag. Overall, I would say that the pen is worth every penny and makes for a great everyday writing instrument. And, it's not the kind of deal that you get every day in the world of writing instruments.